Those who attended this year’s sold out event were especially impressed with our featured guest, Soledad O’Brien. 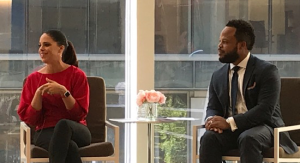 Soledad sat down with Glen O’Gilvie, Center CEO, to talk about diversity, equity and inclusion, sharing insights from her professional experiences as a journalist, anchor and producer. She also took questions from the audience and graciously mingled with participants during the break. Attendees heard from Phyllis Campbell Newsome Award winners, met EXCEL Award winners, caught up with colleagues and made new connections—all while dining on a delicious lunch in a bright, sunny setting with wall-to-wall windows. If you missed the event, check out the highlights and watch the video of Soledad on our Facebook!